Staff is very helpful. Security levels also above expected. Room size big enough, balcony is a plus. Would appreciate having a furniture outside on balcony. 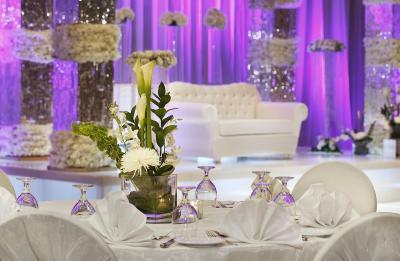 Zainab is representing the best example of guest services and relations’ staff. The concierge. He was absolutely lovely, arranged a taxi for us and followed us outside to make sure it came and our luggage was put in the car. A lovely man who no doubt keeps that place running smoothly! The tv - it had a lot of great channels and the beds were very comfortable. It's a good modern, upscale hotel in the city center. The hotel was right next to the Egypt Museum. The location is great. 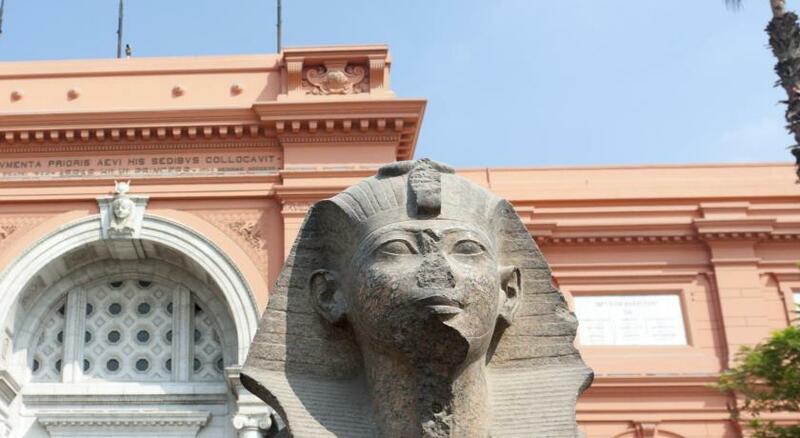 It is only 6 to 7 minutes walk (if you have the guts to cross a few roads) to the Egyptian museum. The staff is wonderful. 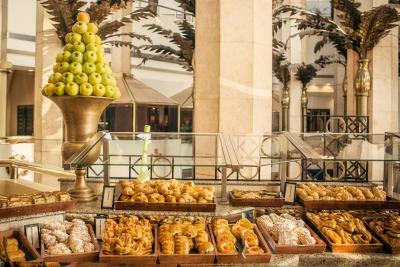 A lot of varieties and delicious food at breakfast overseeing the beautiful large river Nile. We were received by a receptionist at the "Booking" check-in desk called Suzanne and she was amazing at simplifying the check-in process and explaining all the options available. I highly recommend this place. 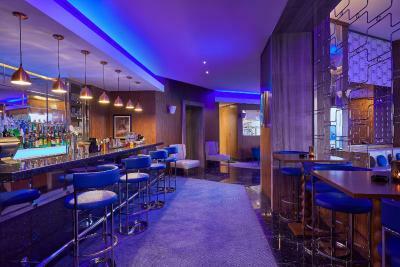 Ramses Hilton Hotel & Casino This rating is a reflection of how the property compares to the industry standard when it comes to price, facilities and services available. It's based on a self-evaluation by the property. Use this rating to help choose your stay! 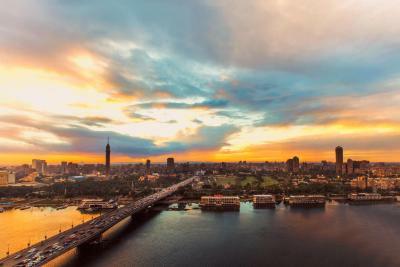 One of our top picks in Cairo.Overlooking the Nile River and just a 5-minute walk from the Cairo Museum, the Ramses Hilton features an elevated pool terrace heated in the winter, an on-site casino and gym. 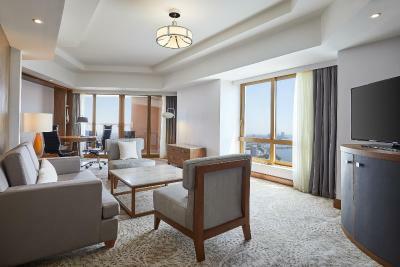 Guest rooms feature balconies offering Nile or panoramic city views. 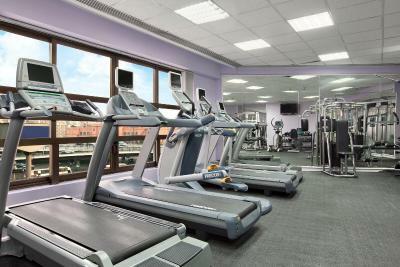 All air-conditioned rooms are spacious and feature warm decoration. They come furnished with sofa and chairs and a work desk. There is also satellite flat-screen TV, a safe box and an alarm clock. 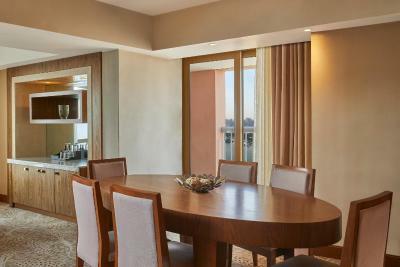 Some rooms also feature panoramic views of the Nile River. 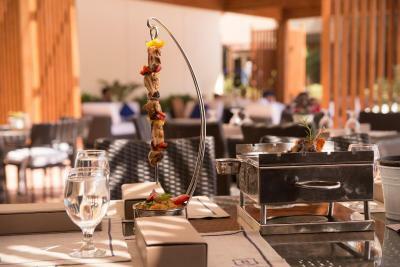 An array of international cuisines along with evening entertainment are available for guests at Ramses Hilton to enjoy. 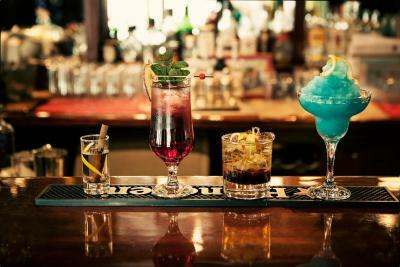 Ranging from Mediterranean specialties to traditional English cuisine at the Sherlock Holmes Pub. 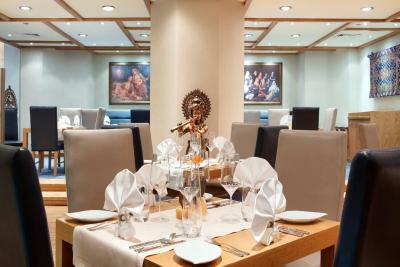 Maharajah Indian Restaurant offers a delicious authentic Indian cuisine. 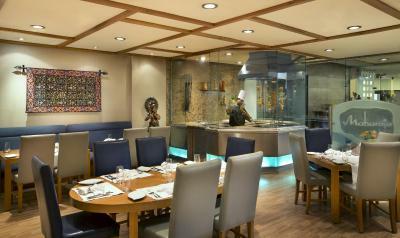 An oriental café, Garden Court operates daily with live evening entertainment. This Cairo Hilton features a billiards room and for those seeking relaxation, there is a spa offering massages, saunas and a hot tub. The Ramses also features an on-site shopping galleria with 250 shops and an arcade. 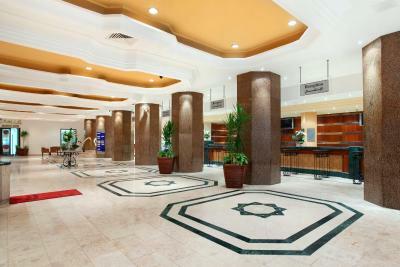 Cairo International Airport is 15 miles away and an airport transfer to the hotel is available (at a charge). 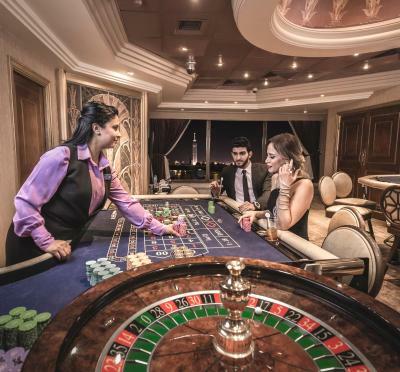 When would you like to stay at Ramses Hilton Hotel & Casino? 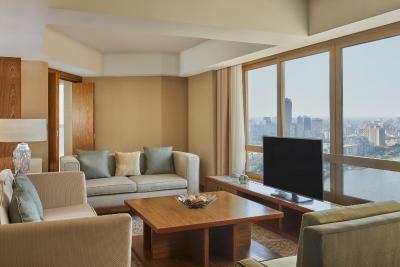 Featuring a balcony with a view of Cairo City, this spacious room has a sitting area and a 32-inch flat-screen TV. 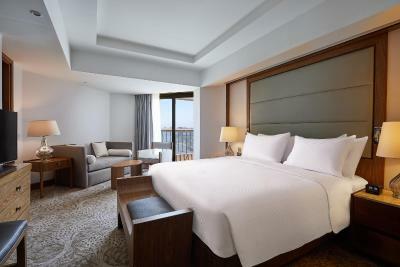 This spacious, airy room has a sitting area and a 32-inch flat-screen TV. The balcony features a view of the Nile River. 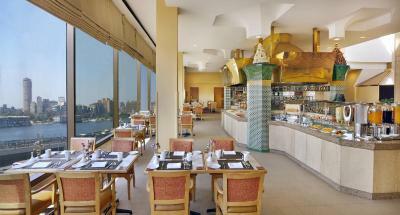 This air-conditioned room features a balcony with Nile view and a sitting area with a sofa. 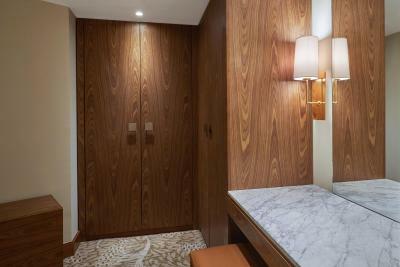 It has a flat-screen TV, a working area and a minibar. 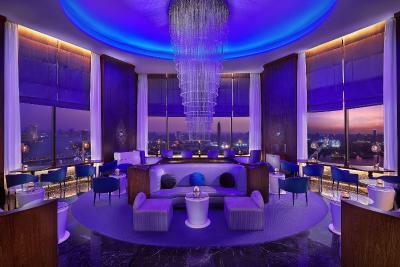 This extra spacious room has a balcony with a view of Cairo City. It has a sitting area and a 32-inch flat-screen TV. 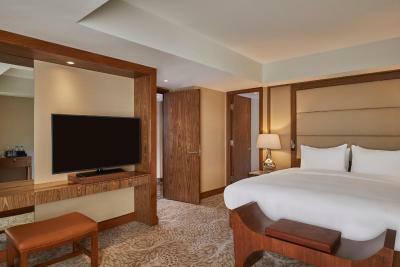 Offering a view of Cairo city, this extra spacious room has a 32-inch flat-screen TV and a sitting area with a sofa. 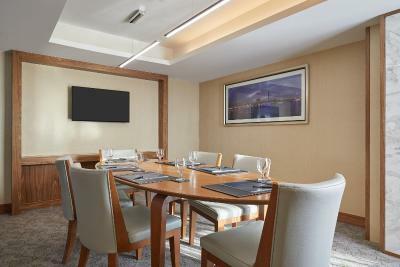 This room features panoramic views of the River Nile, a spacious seating area, working and dining areas, a kitchenette, 2 bathrooms, and a balcony. 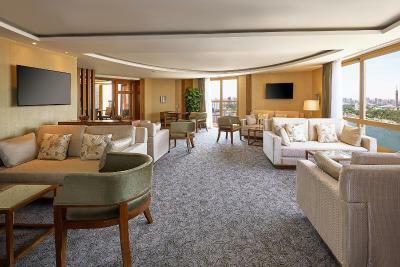 This suite features a bed room and a seating area with 2 balconies overlooking the River Nile. 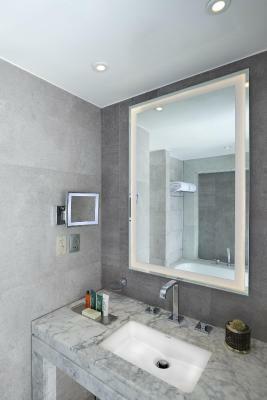 It includes 2 bathrooms, a flat-screen TV and a mini-bar. Featuring a balcony with a view, this air-conditioned suite offers 1 bedroom, a seating area with a flat-screen TV and a small kitchenette. 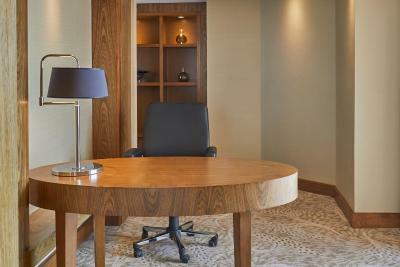 It includes a separate dining area, a desk and ironing facilities. It has two bathrooms with a shower and a bath. 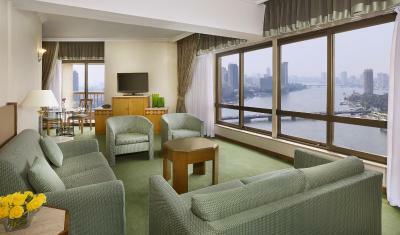 This spacious twin room has a panoramic city view. This spacious twin room has a Nile view. This luxurious room features a panoramic city view. This luxurious room features a Nile view. 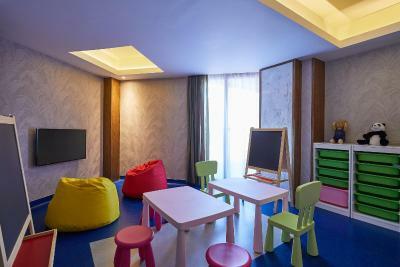 Spacious twin corner room offering a balcony with a view of Cairo City. It has a seating area and a 32-inch flat-screen TV. 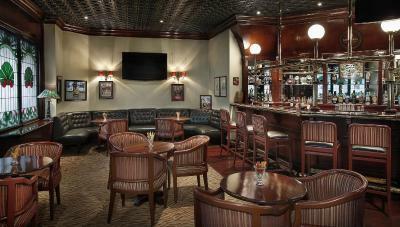 Spacious king corner room offering a balcony with a stunning view of the River Nile. It has a seating area and a 32-inch flat-screen TV. 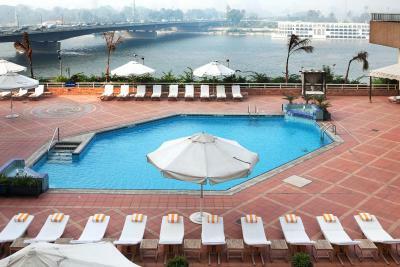 Spacious twin corner room offering a balcony with a stunning view of the River Nile. It has a seating area and a 32-inch flat-screen TV. 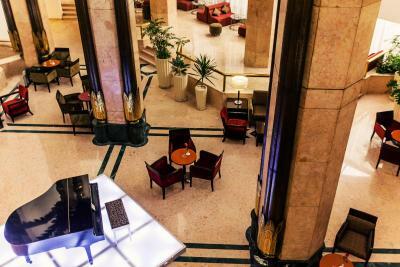 Our downtown hotel was named after Ramses the II, you can find his granite statue greeting you at the lobby. 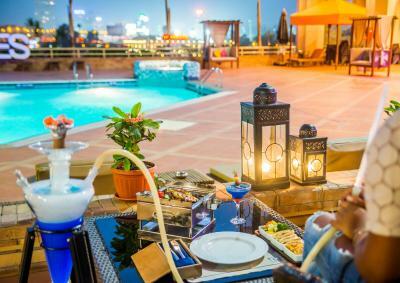 Panoramic Nile views can be captured from our rooftop restaurant & award winning Indian cuisine is a must try at our Maharaja restaurant. 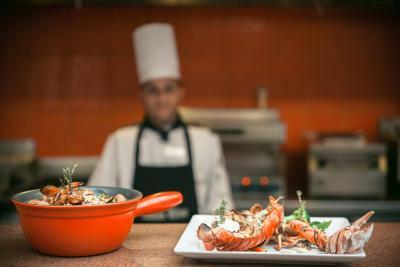 House Rules Ramses Hilton Hotel & Casino takes special requests – add in the next step! Ramses Hilton Hotel &amp; Casino accepts these cards and reserves the right to temporarily hold an amount prior to arrival. Ramses Hilton Hotel & Casino accepts these cards and reserves the right to temporarily hold an amount prior to arrival. The property will be undergoing renovations on the 16th floor for three weeks staring on February 23rd from 10 am until 6 pm. During this period, guests may experience some noise or light disturbances. Breakfast spread was good, with an ideal location of the restaurant. Quite impressive. Rooms could have been cleaned a little more. Shower left a little to be desired (shower head didn't work properly). Hotel staff was great, hospitality was phenomenal. I'm sorry, this is nowhere near Hilton standard. Elevator takes forever to come. Stating the obvious, but hotel is very tired, and desperately needs strip-down renovation. Very excellent and generse very good. When we checked in there was nobody to help us with our luggage, which I found to be unacceptable. The security check you have to go through it RIGHT next to a door that opens automatically inward, so as we were standing there taking our jackets and bags off the door opened and it slammed in to my mother. If she was standing 2 inches in the other direction she could have been very, very hurt. Too busy with constant influx of guests. Great place. Centrally located. Omar on the executive floor was super helpful and attentive! 1- The hotel furnitures are very old and unclean which doesn’t represent Hilton and it’s like a low class apartment B&B. 2- There were mosquitoes in the room Hotel so they must do pests control. We had three different rooms during our stay. We arrived a few days early for a pre booked tour and upgraded our accommodation to executive level which was excellent and how you would expect a Hilton to be. Once the tour commenced we were placed on a smoking floor in a room that was equivalent to two star. A huge let down. Little things you would expect in the bathroom or water/drinks were missing. We left the hotel and returned later in the tour to another room that was a huge improvement on the second room. Overall, it was like staying in three separate hotels. 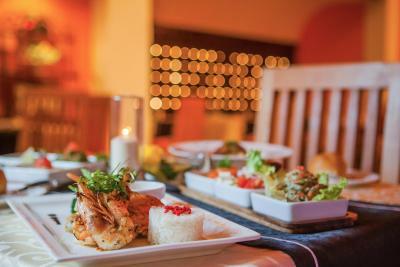 The restaurants however were great and reasonably priced and the staff friendly. Staff doesn’t speak very good English, but they tried to help so wasn’t a big issue. It was very nice that the hotel upgraded us to Executive Room - new, spacious and comfy.